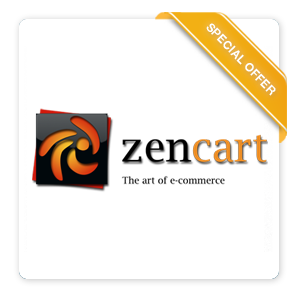 Zen Cart provides businesses focused on eCommerce with unique advantages bundled into one simple yet elegant piece of software. It provides the functionality that you'd expect from an eCommerce platform while providing versatile options like Checkout Without an Account and newsletter subscriptions for registered users. The flexibility of Zen Cart is further compounded by the high degree of customization and extendability provides by Zen Cart's base module and plugins. These features will allow your business to progress further than it would with any other eCommerce solution. Arvixe further supports your business by providing you with an automatic installation of Zen Cart that has been optimized to work with our services. You can then modify and tailor your Zen Cart installation to your liking using cPanel, the unlimited data storage, and the unlimited bandwidth that we provide. Don't settle for a plain, generic web host that will ultimately drag your eCommerce business down with it. Take advantage of our powerful server hardware, customized server configuration, 99.9% guaranteed uptime and world-class support team to enrich your website with our Zen Cart hosting. Learn more about why Arvixe should be your number one choice for Zen Cart hosting and the unique features that we bring to the table while answering any questions that you might have with our FAQ. Copyright © 2003-2017 Arvixe. All rights reserved.